Time for a new pair of overalls - Agfinity Inc. If the last few harvests have felt like one long wrestle you may not survive, this newsletter – is for you. If you might be wondering about giving up and hanging up your overalls, this newsletter – is for you. If you got your best yield and grade, finished all your fieldwork early, and are reading this from a lounge chair in the tropics, this newsletter – is for you, but not for today… It’s for you to read another day, in another time, when you’re ready to look back on your journey and the life-altering pain you encountered along the way. Deciding when to hang up your overalls is not easy. 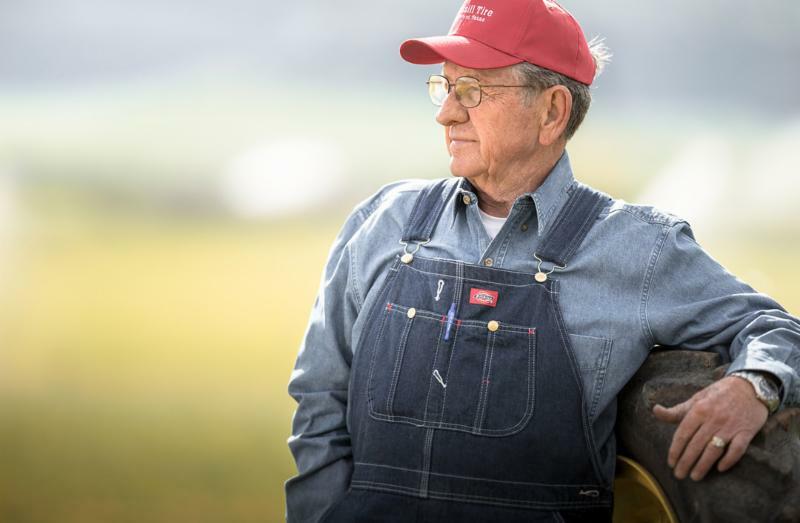 Many veteran farmers have approached this career crossroad once or twice already. They have fought the fight. They have felt true desperation… doubt… and fear. So… what kept them going…? A miraculous wave of relief? A bin of unspoiled #1 canola they forgot they had? Seven matching numbers on the Lotto Max Jackpot…? All of those could be the ticket that turned the tide. But I believe it’s less circumstantial than that. I believe each of these farmers experienced a new day. A foot of snow fell outside our office in Stony Plain Sunday night. Had we not shoveled, it would still be there – packed down by pedestrians and likely requiring a heavy duty snowblower and/or ice chipper. “… I’m shoveling,” I said. We really are at the dawning of a new day, you know. And blizzard or blue skies, it’s time to head out and step into it. It’s time to clear a new path! … And hopefully – with overalls on! Barley: The feed barley market has held steady over the past two weeks. For the most part, buyers are covered/completely full for December movement and are filling up for January. Corn continues to place a lid on the feed barley price. There is still carry in the market as the year goes on. In the Malt Barley world, dry conditions in Australia, as well as central Europe, have caused the global supply to be reported at a near 35 year low. Australia is the largest importer of malt barley to China and there is trade tension between the two countries at the moment, potentially opening a door for Canadian export. Wheat: Gradable wheat markets saw a jump after China and America agreed to a truce on their ongoing trade war. Despite the promise of no more additional tariffs, there has not been much buying and the wheat complex is currently on the down trend . In the feed market, we are still seeing solid demand from feeders, many being full for December. January is also booking up and may be the next best option for those looking for quick movement. Oats: Not much to report in the oat market. Price seems quite sticky; however, we are seeing stronger pricing then last year with over $3 at the bin being reachable in most parts of Alberta. Feed oats pricing also remains competitive with bids ranging from $2.50-$3.00 on farm depending on location and quality. Canola: Canola continues to ride the coattails of soybean pricing and the trends of geopolitical trade wars. The US and China recently held a meeting that gave hope to the canola market; however, the result was a $0.20/bu drop in soybean pricing, dragging canola prices down with it. Many farmers have green sample canola this year, and though there are markets for it, with a mountain of off-spec canola available, prices are reflecting this increase in lower-grading supply. Peas: India, a leader in the pulse market, is also seeing dryness affecting their current crop. This could lead to them reentering the market. The market seems to be buying the rumour with green and yellow pea bids strengthening. #2 Green Pea breaking through the $10/bushel delivered mark in parts of Alberta. We’re hearing from buyers that, this year, from a trading perspective, seems to be quite similar to other years and, rather than the market trending in any particular direction, it seems to be relatively flat. Buyers seem to have good coverage moving forward. Whatever barley and wheat they can’t buy is still being covered by corn and DDGS (distiller’s dried grains with solubles) imported from the US. Corn is currently landing into Lethbridge area at $253 – 255MT. Even though sellers seem to be holding tight on price, buyers haven’t been too concerned and this is evident from the flat market we’ve been experiencing. Trucking is the biggest issue buyers and sellers have been struggling with. Any shipment that needs to go all the way to southern Alberta from the north has been a real challenge to coordinate! Sellers Note: In a flat market, there is still carry or a possible premium to book into future months. This is not always an indication of a pricing increase or a rally. Something to consider is there may be a discount in the spot market because of limited time left in the current month, the challenge of booking freight, buyers being covered and a lack of demand. This has been the case for the past few weeks for any grain being offered in December. There is a current discount, but a stronger price in January, which is not signalling a premium for the new year. Dec-May: $6.50-6.90/ bushel picked-up based 13-13.5% protein. Dec-May: $6.50-7.00 picked-up based 13-13.5+% protein. HRS with a 300+ falling number will have a premium! Dec-June: $6.60-7.00/bu picked-up (13% protein). Dec-May: $6.75-7.10/bu picked up based 13-13.5% protein. Nov-June: $6.85-7.15/bu picked-up based 13-13.5% protein. December-January: $2.50-$2.90/ bushel depending on quality. *$0.25-0.50/bu premium available for wheat with high protein (13%+) / good falling numbers (300+). Nov-June: $6.80-7.10/ bu picked-up based 13-13.5% protein. December-January: $2.50-$3.00 depending on quality. December-March: $2.60-$3.00/ bushel depending on quality. December-March: $2.50-$3.00/ bushel depending on quality. December: $3.00-$3.30/ bushel depending on quality.